THX-700 probes are designed to work with the heavy duty HDX handle. 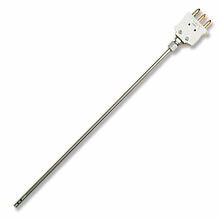 Each probe has a 3-pin OTP plug and precision 44018 linear thermistor element, rated up to 100°C. General Purpose Probe For general purpose gas and liquid immersion measurements. Made from a rugged 1/8" (3.1 mm) O.D. 304 stainless steel sheath, 12" (304 mm) long, it will adapt to most process applications. Penetration Probe Easily pierces soft and semi-frozen material as well as soil and sand. Made from a rugged 1/8" (3.1 mm) O.D. 304 stainless steel sheath, 12" (304 mm) long. Air Probe For HVAC applications. The 3/16" (4.8 mm) diameter sheath and radiation hood easily fit into duct-work, grilles, and vents. The probe will work with the OMEGA™ HDX handle or can be cpnnected to a 3-prong standard receptical and be permanently mounted with an OMEGALOK™ compression fittings.